Drain a can of chickpeas and tip into blender. Traditionally you add Tahini - a paste made from sesame seeds but we've run out. Also it's often made with garlic, but Toby said no to adding it today and chose cumin instead. If the consistency is a bit too thick, just add a bit more yoghurt. You can also mix it up with your own twist. We like lemon juice, olives or sun dried tomatoes for variety. We served this hummus with salad and wraps. 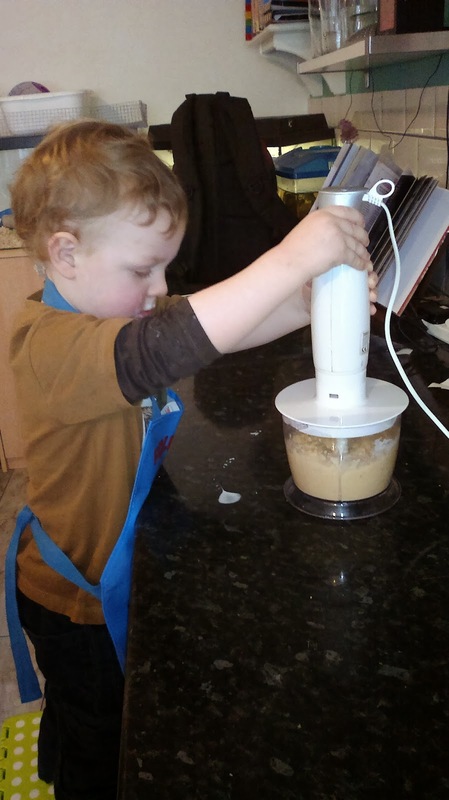 I like this activity because it's fairly instant food gratification for Toby's fairly short attention span, and offers lots of opportunities for him to tip, shake and make decisions about quantities and added ingredients. Cheesy marmite soldiers (teaspoon marmite stirred into pastry, cut into fingers, sprinkled with cheese and cooked). Safety bit: watch little fingers on open cans as because of sharp edges sharp edges. Also requires close supervision when using blender - I unplug the blender completely and move it out of reach if I have to step away even for a minute when using it without the base attachment shown in the picture.